I work for a MAO and have a performance program around coding (HCCs). We are finding out that we are not getting all the diagnosis codes because the clearing houses are eliminating any code that does not have a pointer assigned to it. Is this industry standard? What have you heard if anything about this? Thanks! 1. If the Clearing House is not giving you EDI 5010 and instead giving you a file that has been prepared for import into your claim system, sometimes that map is set up in such a way that the diagnosis are stored at a line level in your claim system. Since your claim system stores them at a line level, no more than four would ever be needed on a claim. While your claim system likely has been updated, the map from your clearinghouse may not have been. 2. The Clearinghouse has an older, legacy system that has not been updated and therefore drops codes. I know of one Clearinghouse where this is the case for sure, but don’t want to say their name here on a public forum. If it is not one of these two, there are a bunch of other things to track down as well that I could walk you through no problem. I’m looking at pg 371 of understanding health care. In the diagnosis pointer blocks they have A, B, C and C listed. Have they switched from numbers to letter? I’m looking at the post from Becky, which makes me question this. I can’t comment on what is in the book, but if they are talking about Diagnosis Pointers, it is wrong. I can say that if we are talking about transmitting an EDI claim (x12 837P v5010), the standard only allows numeric responses and then only values 1-12. This data is found in the 2400 Loop, SV107. If we are talking about the paper form (CMS 1500), the Diagnosis Pointers are written / typed in Field 24e. Since people mix this up often, they even wrote on the form that you can only have a value of 1,2,3, or 4. They wrote this with an arrow pointing to 24e inside of Field 21 (Diagnosis). Hope this helps. If not, let me know and I would be happy to help any way I can. This means that any payers who use the results of the paper form (accepting print feed, OCR results etc.) will need to do a crosswalk from A-L / 1-12 if they first convert the feed to EDI before loading into their claim system. I’ll update the post to reflect this. I’m currently back-tracking from MA RAPS data to source claim data. For claims in which there are both MA-valid and MA-invalid procedures, in your opinion, how often are providers billing with pointers vs. simply applying all ICD9s to all CPTs? Do payers reject claims that don’t have pointing? When providers submit the information, they can only point to a maximum of 4 Diagnosis codes, so you don’t have to worry about applying all ICD-9s to all CPTs. Yes. Almost all payers reject claims that don’t have pointers. For Medicare Advantage risk adjustment though, you don’t have to have a pointer for it to be submittable. Imagine an office visit where a full health assessment was done on a person with many different things wrong. You might have Diabetes, a common cold, a lower leg amputation, a rash of some kind, a headache and a few other things. The only “procedure” for that event was the office visit (say 992.13). The doctor might only point to the cold as the reason for the visit but that doesn’t mean the assessment of all that patient’s health conditions weren’t confirmed or addressed in some way. Thanks, for the quick reply. So 5010 allows for 12 total Dxs but only 4 per CPT? Here’s problem: PCP claims with both 992xx and 36415 (Blood Draw) CPTs in which an ICD9 code is pointed to the 36415 only. It’s not common, but it’s not insignificant either. In this case I’m recommending that the 36415-pointed ICD9 not be submitted for RA. I don’t know if I want to get into specifics of what things should be submitted from a clinical standpoint for risk adjustment here. What I will say is that you should not worry about the pointer at all when working on risk adjustment. The pointers are there so that when making a claims processing decision, it will cut out some of the noise. You wouldn’t want to pay a claim where the diagnosis was stubbed toe and the treatment was removed kidney right? That doesn’t mean the person didn’t stub their toe. The toe is still stubbed. It was just addressed with a different treatment most likely. The proper way to code an encounter is to submit all diagnosis for the visit and then for each treatment, submit the most relevant related diagnosis – up to four. More than that, and it just stops adding value for the claims process. That might mean that some diagnosis are NEVER pointed to in a claim. That doesn’t mean the person does not have the condition. It simply means that whoever coded the claim didn’t think the non-pointed to diagnosis were the MOST relevant. If you don’t like the blood draw because it may have been done by a tech, that is your call – one that is not uncommon. But don’t worry about the pointers when deciding what to submit. Ignore them. I have not heard this and a cursory google search didn’t turn up anything. Can you give me any additional background to go on? Who informed you of the change? Maybe I can find something if I know what to go on. The only change I know of in April was the paper form change noted in the article, but that still allows 4 pointers. I would say that to date, it is good to have multiple pointers. Some treatments are really only done when more than one condition is present and so they are useful to telling the story of what was done and why. “Item 24E – This is a required field. “Enter the diagnosis code reference number or letter (as appropriate, per form version) as shown in item 21 to relate the date of service and the procedures performed to the primary diagnosis. [Item 21 is the actual list of ICD codes.] ENTER ONLY ONE REFERENCE NUMBER/LETTER PER LINE ITEM. When multiple services are performed, ENTER THE PRIMARY REFERENCE NUMBER/LETTER FOR EACH SERVICE. “When using form version 08/05, this reference will be either a 1, or a 2, or a 3, or a 4. “When using form version 02/12, the reference to supply in 24E will be a letter from A-L. Otherwise, the instructions above apply. My question is whether this instruction applies ONLY to CMS-1500 claims, or if it applies to CMS-1500 claims and “electronic equivalent”. In other words, will the Medicare Administrative Contractors penalize for submission of (and account for) multiple same-line diagnosis pointers submitted in an ASC X12 V5010 837P transaction? I’m submitting an itemized bill for an Aflack-style accident policy claim. Unfortunately the person who filled out the form must have been very lazy as they screwed up my health insurance info. They also checked no to “is the patient’s condition a result of an accident,” which puts the validity of my claim in jeopardy. The diagnosis pointer is listed as “AB”. Does this indicate an accident or am I going to have to get a revised bill to indicate an accident? The “AB” in diagnosis pointer will have no bearing on whether the claim is the result of an accident one way or another. It is common to forget to check the box on whether the claim is the result of an accident as the default is unchecked in most submissions. I suppose you could try and get the bill revised, but frankly, I would just go up the ladder at your insurance company and not take no for an answer. Talk to their boss and if they say no, talk to their boss’s boss. We are being told for our Medicare advantage programs we have to send all the diagnosis that pertain to that patient per visit. If the patient has 10 diagnosis codes but only an office visit charge then we can only point to 4 codes. If I send all 10 codes but only use 4 pointers will all the remaining 6 codes be available as long as they are either sent on the HCFA 1500 or the Ansi 837 5010 format? You are correct that you would note all 10 diagnosis codes and then only send pointers to the 4 that are most relevant to the visit. If an office visit takes place where someone came in because they had a cold, but they have lots of other things going on like diabetes, a previous lower leg amputation, a history of AMI, etc. etc. you note all of the things wrong with the person – especially if they were evaluated in any way. You MAO plan will be very happy with the properly coded claim if done this way. I specialize in a Cranial Prosthesis, would my diagnosis pointer always be the same, like “1” maybe, and opt/hcpcs always the same number? all I do is the Cranial prosthesis. Sounds like you have one half of the equation done: what was / is done. The pointer is often referring to “why” it is done. Are there many reasons one might do a cranial prosthesis? Say there are many things wrong with the patient – and some are perhaps unrelated to why you are performing the procedure. Use the pointers to indicate what diagnosis are most related to why the procedure is being done. If there are five diagnosis listed on the bill / claim and all are related, you would have four pointers – 1,3,4, 5 for example – and pick the four diagnosis that were the most important / relevant to the procedure. Hello! I am inquiring about Diagnosis code Pointers – I understand that up to 12 diagnosis codes can be accepted via paper or EDI along with the corresponding diagnosis code pointer on each Service Line. But my question is when we are instructing the providers to bill ALL diagnosis codes which will impact the Risk Adjustment Program (RAPs) and HEDIS for the provider and insurance company – how can a provider bill the pointers for 12 diagnosis codes if they only have say two Service Lines (i.e., 992xx and 364xx)? Some documentation states “the top 4 dx codes” but most provider office personnel will pick the first 4 dx codes which may not include the most important ones. Just wanted to see if there was away to get all of the dx codes for each Service Line. Hello Lee. Sorry about the delay. Insurers should ignore the pointers for risk adjustment purposes and consider all claim level diagnosis apply to every line when submitting for risk adjustment – not just those that have been pointed to. The (up to) four pointers at any line level simply represent the TOP four diagnosis for any given treatment. When coding, you describe a common problem where the FIRST four are used instead of the TOP four. No insurer is going to deny a claim for an office visit for diagnosis reasons and so the provider will be paid and there is no direct, immediate, financial reason to change coding behavior for the coder / submitter. I have seen problems deep within large insurers systems (claim systems, data warehouses, risk adjustment platforms, EDI Mapping tools etc.) where only pointed to Diagnosis are written out. This represents a data DROP and needs to be fixed as soon as possible. Thanks for the information. Hopefully in the ACS X12 6020 version (which I haven’t seen, yet) the industry will address this issue. Thanks for your help. Hi Dan . . . How is a ‘data drop’ addressed after the claim has been processed and paid? Is there a way to resubmit the additional diagnoses for HCC capture only without re-processing of the claim? Thanks in advance for any help. The most common ways data drops are resubmitted are via a chart review. There is a specific way to format the EDI submission to reflect the fact that a chart review has been completed and the data is not an original submission. Chart reviews are very common in risk adjusted environments. Hi, Are the diagnosis code pointers keyed in by the billing person at the provider’s office when sending a claim? This is confusing, as I don’t know if the box is filled in automatically, or if we are supposed to fill it in. Thanks for your help. Usually the diagnosis pointers are entered by the biller at the provider’s office. I suppose it is possible that some applications default diagnosis pointers in some systems. Also, instead of entering a pointer, the biller might click on or select in some way the diagnosis that should be pointed to on a line. Hi! I had a question I hoped you might be able to shed some light on. We’re having trouble with our multiple immunization claims passing the edits of our clearinghouse since the change to ICD 10. They have simplified the diagnosis for all vaccines down to just one code, Z23. We routinely give 4 vaccines in a single visit, plus the administration/counseling CPT codes. On each claim we’ve tried to submit, it gets rejected as “diagnosis codes must be unique”. I have contacted the clearinghouse (can’t give billing advice) and searched everywhere for the answer to this dilemma. All that I can find is that this should be so much simpler, since each vaccine doesn’t have a separate diagnosis any more. Any advice? You are listing Z23 four times when submitting the diagnosis. If so, list it only one time and point to it four times instead. If it is a claim that is only the four immunizations, then you should always have a pointer of “1”. The clearinghouse is incorrectly rejecting the claim. Perhaps something in their logic that was updated for ICD-10 has broken this as well. While it is possible that you could convince the clearinghouse to look into it and provide a better explanation, I would also contact the health plan and have them work it from their end since the clearinghouse is enforcing (incorrectly in this case) the plans edits and therefore should have more influence over how their edits are enforced. Have the plan supply to you the exact logic that is supposed to be followed. If this is a covered service, they need to accept your claims and the responsibility should fall to them to get it resolved in short order. While there are other possibilities, I don’t think I have enough information to come up with anything else. As a personal favor, please reply with an update to what the resolution is to help satisfy the professional curiosity that fuels this post in general. Or feel free to reply with any other details that you think might help me troubleshoot further. Thank you for getting back to me! I’m implementing your suggestions and waiting to see what results. I’ll keep you posted on what I find out. I’d love to know if we are the only ones having trouble with this, if this is a common problem among pediatric offices (since we routinely give multiple shots at a time). Thanks again! My pleasure! Very happy to help. Please let me know what ends up being the issue (#1, #2 or something else) so I can help others if something similar comes up again. I am a PT. I do my own billing, which is very mostly Medicare. I attended a Medicare seminar years ago, in which we were given a book which allowed us to choose appropriate diagnosis pointers for each diagnosis using ICD9 codes, which correlated to the procedure code. Now that we use ICD10, I am not sure how to choose the appropriate diagnosis pointer for each procedure code. Any help would be most appreciated. Thank you! Howdy Joan. Any way that the article itself helped? I’ll give a few ideas to you, but please let me know if you have more specific questions. You can still point to between 1 and 4 codes for each procedure. So even though the codes are different, the pointers should still work the same way for you. If before you had two ICD-9 codes related to a single procedure and now you have four ICD-10 codes related to a single procedure, instead of using pointers 1,2 you would use pointers, 1,2,3,4 to relate them. If that is unclear or doesn’t help you specific question let me know. In fact, if it DOES help, kindly let me know that as well as I am always pleased to either hear that I helped, or learn how I could answer questions better. Hi Dan! Thank you for posting this useful page. I am a medical biller in a chiropractic office. With the implementation of the new ICD-10 codes, our level of specificity has greatly increased. In ICD-9, we simply indicated that an adjustment was done in a spinal region, in ICD-10 we must also specify the level (ex. Thoracic level T1/T2, T4/T5, T7/T8 etc). So there are times where the codes for one area take up the first four. Our contracts pay out depending on how many “areas” we adjust. So we commonly use one of three CPT codes, 98940 1-2 areas, 98941 2-3 areas, or 98942 3-4 areas. I have been having some trouble with injury payers denying saying that we are not pointing to enough areas to support diagnosis for how many areas we are billing for. They recommend that we switch our pointers in box 24E to indicate A-L instead of A-D. However, the resources I have consulted state that we can only point to ABCD. Also, our software system only allows us to manually point to A-D, I literally cannot choose more codes to point to unless I set it to “use dx list from chart,” which frequently does not reflect the correct number of areas with just the first four codes. I know that some of these issues may need to be individually reconciled with the payers and our software company, but I am hoping that you can advise me on the box 24E dilemma in a few ways. First, is it okay to point to 4 dx codes that are “out of order” from the dx list provided by the doctor? For example, if he inputs 4 thoracic dx codes then 3 lumbar then 1 for sacrum, is it okay to select any of the 4 of the 7 codes to point to in order to indicate to payers the number of areas adjusted? This would mean only these four codes would show up on our hcfa and not the full 12+ that the doctor reported in his chart note. Second, do you know if it is appropriate to change the pointer from A-D to A-L? I am slightly confused because I’ve heard a lot about it but many sources still say regardless of A-L we can only point to four codes… is it common for providers to switch to A-L? The clear thing here is that your software vendor is NOT ICD-10 compliant if they don’t allow enough pointers to get to any of the 12 potential codes. You need to fire the vendor, get a refund, get the software upgraded if there is a new one or get a typewriter to fill these out manually (last one being a really bad idea in case that is not clear). Have the vendor call me if they say otherwise. – eg ABC, ACEG, BLD, CBA etc. The order should generally be the most relevant Diagnosis code for the procedure being billed is pointed to first with the others being pointed to in descending order. The first code pointed to is generally considered the primary reason for the treatment. Please tell me if this helps either way and if you have other questions I didn’t make clear. The order of the codes is not random. For each encounter, you can list up to 12 DX codes. These codes may or may not all be pointed to. For one procedure, point first to the primary reason (DX code) you are performing the procedure. Next point to any other reasons you may be doing the procedure, up to three additional codes. As far as getting paid, as a general rule, more detail helps. So even if you never point to some of the codes, include at the encounter level as many as are relevant to the encounter. Also, be sure to point to as many (up to four) that are relevant to the procedure in the order of importance. If there are leftover DX codes that are relevant, but not pointed to, at least the payer has them at the encounter level and can see them there. Just because a code is not pointed to (because you already used four) doesn’t mean it is not relevant to the procedure. this is my first time using the CMS1500 VERSION 2/12., my Main Problem is with field 21 and 24E. in field 21 — must I fill all the line from A to L with a diagnose or just the first four . and how is this field connected to 24E– what should I type in field 24E. If the dictation is giving more than 4 codes, is the coder requiered to use upbto 12 codes per line? Or do they have to codebonly the 4 more important ones? 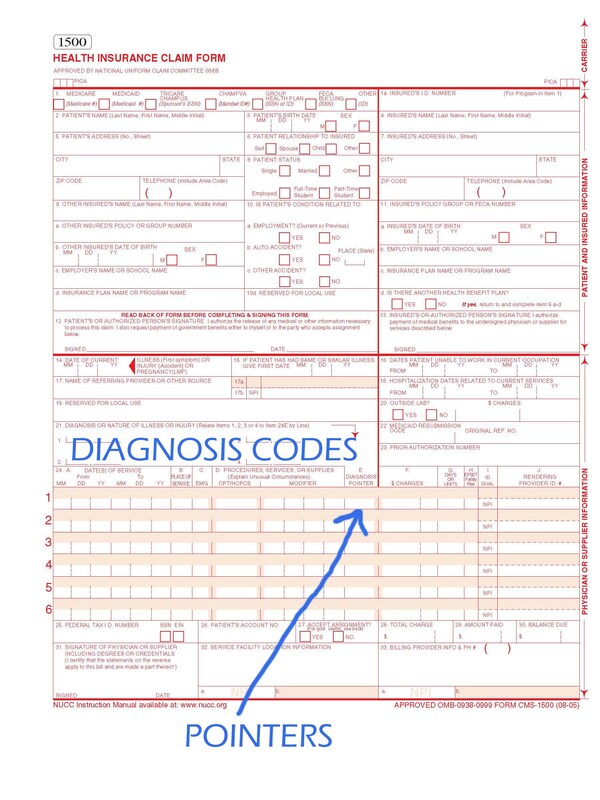 Pretty sure the FAQ covers this already, but diagnosis codes are not at a service line level. Only the pointers are. You can point to up to 4 that you think are most relevant. You should put every code (up to 12) from the “dictation” at field 21. Thank you very much Dan. I am having an issue with paper 1500 that are being mailed to a Risk Plan. The office is putting all MRA codes on the claim however it seems the plan is only using the 4 that are pointed to in 24E with the E&M CPT. We have been told the claims are “hand keyed” by the plan when they receive the “paper claims”. Have you run into this before ? I was told I can repeat CPT to the paper claim with and continue down the alphabet until I have covered all of my DX. Have you heard of this or dealt with this before ? Yes. Usually it is because they are scanned and hand keyed off shore. When they key the information in, it could be that their vendor’s entry process only has four places to put codes because they have not updated their process to take more codes. Either way, if anyone at the plan in management understood that they were dropping codes due to their process, they would be very upset. And, then four (4) of those 7 diagnosis codes are “pointed” to the office visit (cpt 99204)… and that’s it. No other procedure performed. Just that office visit for a patient with a plethora of medical issues– that are all duly and thoroughly addressed by the health care provider. Now that we are ready to “bill” the claim out, my electronic clearinghouse claim 837 still enables me to list up to twelve 12 different diagnosis codes for this patient’s one service date, but if I only point to 4 of them (only because we are imposed a limitation of up to 4 diagnosis codes per line charge that can be pointed to), and send it out, the rejections come back because I did not “Point” to all 7 of them…I am confounded by this, and frankly- not all patients have just 4 things wrong with them. Some have, dare I say, 5…. or 6….. So it appears that our coders are to use their own best judgement and just delete out all but the 4 diagnosis codes on that respective claim that we would then “point” to for that office visit charge, correct? Please help. This is causing delayed claim submittals, and double the work for our A/R reps. Thanking you in advance! Howdy Diana! What you described is very clearly wrong. If you only have one service line, you can’t possibly point to all 7 codes. My advice is to get help. The payer doesn’t want you to get rid of the codes to make it submitable and would be very mad at the clearinghouse if they did. If you can’t get anyone knowledgeable at the clearinghouse to help, call your payer and get beyond the first level of customer service until you get to someone who understands what you are telling them. What is the name of the clearinghouse you are working with? Hi Dan, Thanks so much for your reply. Our clearinghouse: Trizetto (formerly Gateway EDI). The issue has been brought to the attention of my superiors, and we need to have this rectified STAT…Would you be able to advise or assist any further? Regarding the above question from Diana. I come across this exact scenario on a daily basis in our medical office. Dan – can you point me to the literature where it talks about the # of diagnosis and CPT pointer you reference. My boss fails to grasp the fact that even though there is only 1 CPT code and perhaps 7, 8 or 9 Dx codes that we should only be putting 4 Dx codes per 1 CPT code and remove the additional 7,8 or 9 diagnosis codes even though we only have 1 CPT code. You are not removing any of them. If there is one treatment (an office visit let’s say) and there are 9 things (diagnosis) that were evaluated, confirmed, diagnosed or related in any way during that visit, you list them all in the diagnosis section. Then when you are at the line level, you point to the ones that are most related to the visit. . . up to a maximum of four. I hope you will answer the question posted by Gregg Bingham on May 23, 2016. It appears as a reply to an older post by you on August 23, 2014. Dan notes, as I have, too, that Medicare instructions for CMS-1500 claims state that one should use only one diagnosis pointer for each service, i.e., for each claim line or each CPT code. Furthermore, I am wondering whether, if Medicare will accept more than one diagnosis pointer for a CPT code when the claim is submitted electronically, it might be to the provider’s advantage to list more than one when appropriate, as it might be a step in the direction of justifying a higher-level E/M code. Use as many as are relevant starting with the most directly related reason (Diagnosis) to the least up to a maximum of four. I suppose more is better if they are all relevant. Correction: I should have written “Gregg notes” and “Gregg continues” in my post above. I wrote Dan instead of Gregg. Sorry for the confusion. Dan, I’m a Massage therapist and have a family that is Authorized by Aetna “Foreign Service Benefit Plan” to get massages. I’ve been trying to get this paid through electronic, but the reject due to: 2 # errors LC1701 – Diagnosis Code 1(A) is Invalid. I’m using ICD-10 code 8E0KX1Z. Any suggestions or direction, greatly appreciated. Hello, I have two diagnosis codes . So it would be “A” which is “1”. And “B” which is “2”. So in 24e what would I put ? Would I put 12 ? The last two sections of the FAQ as well as numerous questions / responses speak to this. Please read it over and let me know if you still have questions. Where can I find the descriptions of A-L? I am billing medical for a dental problem and can’t seem to find out which diagnosis pointer to use. I believe this has been answered in the article. Please re-read it and let me know if it is still not clear or you can be more specific about what is still remaining. WHAT DOES A OR 1 MEAN? 1-12,A-L. I’M LOOKING FOR A LIST THAT SHOWS WHAT THE LETTERS STAND FOR. Sorry you are having a tough time with this. Please try and take a look at the article from the beginning and see if it helps. I DON’T THINK THE CAPITAL LETTERS ARE HELPING ME UNDERSTAND WHAT ISN’T CLEAR . . . ahem. Thank you, I finally figured out.The diagnosis pointer in 24 E relate to box 21 A etc. I did not mean anything by using capital letters. Sorry. I have 4 diagnoses for a 99213 visit and our billing system only allows space for 2 letters for the diagnosis pointer. How do I get it to indicate ABCD? My guess is that your billing system is electronic right – not paper? So it SHOULD be looking for numbers not letters. The two digits are there because each pointer can be up to two characters (1-12). See what happens if you enter a “1” or a “01”. Perhaps it then allows you to enter another pointer? I have a claim with 6 diagnosis codes billed. One code was invalid when file . Is it a CMS requirement to deny the whole claim if the only one code is invalid however said code only points to line 2 of the claim? If so would you know where I can find the information in writing on this ? Not sure specifically on the CMS side, but I would guess that any invalid diagnosis codes makes the whole claim denied at most plans. Diagnosis are submitted on the claim level whereas treatments are submitted on the line level. So some plans may only reject a single line and allow the rest if there is a problem with a treatment, but likely won’t be able to do the same with a diagnosis. Rather than find in writing where this might be, just to get a similar answer, I would suggest it be refiled instead with valid diagnosis codes. Thank you for sharing this helpful article. I have a question regarding EDPS Submission for an MA org. We are getting Error 254- Principal Diagnosis code is invalid for DOS and Error 255- Diagnosis code is invalid for DOS on some of our claims. How can we resubmit the Claims for which we received 254-255 errors? Can we remove the Diagnosis which is either a duplicate or expired for the DOS? If we remove those Diagnosis from the header then what do we need to change at the details level as far as Diagnosis pointer is concern? If we were to remove ICD_2 (F3WRNG) , how would it effect the Detail Diagnosis_IDX column? Feel free to give me a call and we can discuss. This is a pretty specific scenario and I have enough questions that attempting to answer it here without other information wouldn’t work. Thank you for your article! I am a billing supervisor and have been going back and forth with a vendor stating that we can only bill 4 diagnosis per claim. They also stated it was a CMS guidelines. Well I know this is simply not true and I can’t get anywhere with this software or get the practice doctors to understand that the software that we are using is not compliant! Help! is there a formal complaint that I could do. I have been complaining for over a year! We can hope they are not incompetent and instead count on confusion here perhaps? We can only link 4 diagnosis per service line, but that is in NO WAY TRUE for the claim. A professional claim can have up to 12 diagnosis. Send them a copy of the paper form with the 12 spaces for diagnosis circled as proof perhaps?